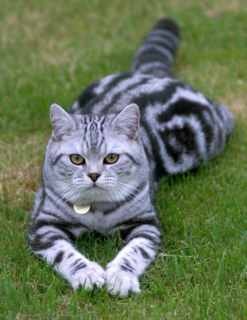 Generally known as a British Shorthair or a British and often abbreviated to BSH. British Shorthairs usually live into their early teens but it has been known for them to live much longer but generally 15 years is an average life span. The British Shorthair is one of the largest breeds of cat. It is chunky and substantial, the male is much larger than the female. The face is round with full cheeks and the nose is short and broad. The chin is deep and strong. The ears are small and rounded and set so as to blend with the round contour of the head. The eyes are large and round. The head is set on a short thick neck. The body is cobby with a short level back. The chest is deep and the shoulders are strong. The legs are short and strong with round paws. The tail is thick and of medium length. The British Shorthair is a large cat and will require approximately 70 Kcals per kg bodyweight per day of food. However, many British Shorthairs are prone to obesity, particularly neuters, and some restriction on their diet may be necessary. British Shorthairs usually have between three and five kittens in a litter, though one of my girls successfully reared eight kittens not just once but twice. Generally British Shorthair queens make good mothers, being placid by nature, they are very content with their brood. Cats being cats there are occasionally some cats who do not like the shows, or do not take to breeding, this is no reflection on the breeder, it is part of the cats' charm that they are individuals and we as cat lovers have to accept this.